Most of you know that finding a cyclical trend in MTG finance can serve as a pretty smart and easy way to make money. The most obvious trend has typically been to buy Standard dual lands while the set they come in is being drafted, and then sell them when the next block rotates in. Doing so with the Scars of Mirrodin fastlands, Innistrad checklands, Kaladesh fastlands, and, most recently, Dominaria checklands would have given you some decent profits with minimal risk. This doesn’t always hold true, though, as you can see by the Theros scrylands. However, there are other trends we can look for when it comes to Magic: The Gathering finance. Everyone is aware that retail stores have a lot of sales between November and December with Black Friday deals and standard holiday sales. In fact, many retailers see a significant portion of their yearly income in that two-month time span. I’ve been tracking my total Magic expenses compared to total Magic sales over the year and found a few trends. 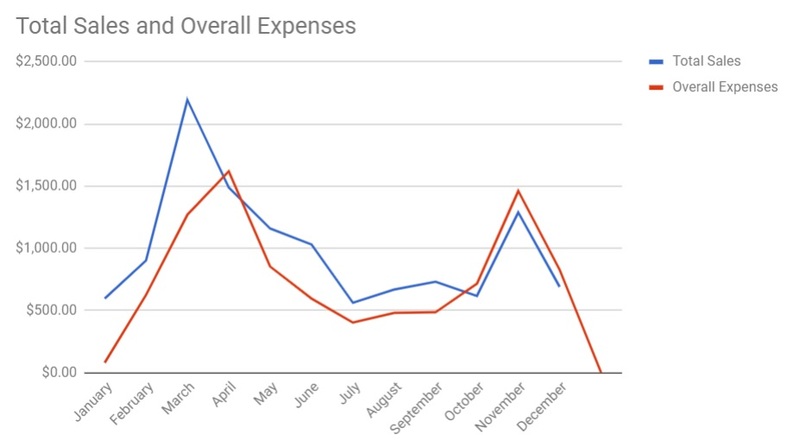 The graph above shows my total sales versus total expenses on a per-month basis throughout the year. While this only represents my store and only one year’s worth of data, it’s still somewhere to start. There is some additional important information that needs to be stated upfront for any trends to have accuracy. Throughout the year, I kept my total number of listed cards relatively consistent, between 500 and 700 at any given time. Though now I’m up to around 1000 cards. My main focus has been Commander cards throughout the year. This means I didn’t have much Standard inventory, so my graph shouldn’t show dramatic swings when set rotation or major metagame shifts occurred. One would expect shifts when new Commander product was released, which occurred on August 10, 2018. However, there doesn’t appear to be any spikes with regards to my sales related to the release of Commander 2018. I began aggressively buying cards in March and April to build up store inventory. I purchased a fair number of Reserved List speculation targets the first few months of the year. Many of these I haven’t put up for sale just yet, as they haven’t hit my expected price targets. I began aggressively buying Ultimate Masters reprints when the set released (December 7, 2018). I purchased two boxes of Ultimate Masters on separate occasions (both in the month of November) which accounts for a large part of the expenses tied to that month. I definitely saw the “summer lull” that many store owners talk about, which I honestly didn’t expect because it’s usually tied to the Standard format and upcoming rotation. However, sales throughout the months of May through September were rather abysmal, despite the fact that most of my purchases during those months were for store inventory. Most of my summer purchases were tied to the good Commander reprints in Battlebond, as I saw those cards reaching new lows. The only other speculative purchases throughout the summer were tied to a few Standard speculation targets. I did very well on the Dominaria checklands. But I’m still waiting on Mox Amber, which hasn’t done anything but drop and then sit in the $5ish range on Facebook sales groups. Now it’s important to consider that if a lot of stores see the same summer lull issues it may be a great time to be a buyer, assuming you don’t have overhead costs. The reason for this should be somewhat obvious—if sales are abysmal for a store owner who has to pay all their overhead costs every month regardless of their actual sales, then one would expect sales prices to drop to increase sale velocity. Thus, when sales are down, it’s a good time to be a buyer. I clearly saw a nice sales bump at the end of the year. I have no doubt this was heavily influenced by TCGplayer offering multiple kickback sales throughout that time period, though I never had any insane sales days on the biggest kickback days (Black Friday and Cyber Monday). I know that I owe a fair amount of my expenses to Ultimate Masters buys, with four boxes and another $524 in various singles accounted for. I’ve talked to several store owners, and an increase in sales in the early spring seems to be a somewhat common occurrence. If you consistently notice a lot of sales in the spring, then it makes sense to avoid dropping prices to encourage sales during that time frame, as the sales should occur naturally and it would be smarter to save price drops for slower times of the year. This may seem counter-intuitive, as when you’re flush with cash the natural inclination is to be in a buying mood. However, it’s more beneficial to save your purchases for times when others aren’t buying, which will maximize your leverage in any given transactions. I’ve covered the concept of cash-flow analysis before, so if you’re looking for more details, I’d check that article out. It’s important to gather data at an individual store level and to use that data to your advantage. Every sale is a data point. Any trends you can identify from these can be extremely beneficial to your store, whether it be online or a physical presence. Utilize this data to determine the best times to buy cards, to understand when cash might be tight, when sales should be implemented, and to help alleviate risks of cash shortfalls. One additional lesson I have learned while reviewing this data is that I need to record more information for each sale, specifically the format I think the sale is for. This way I can do a more detailed analysis for future trends.